William Sidney HOWES was born on 11 February 1849 in Newcastle-on-Tyne in Northumberland, England to John HOWES and Sophia SMITH. At the time, the family was living in Miller's Hill, part of Newcastle-On-Tyne. By the time of the 1851 Census William was living in Great Yarmouth in Norfolk and spent most of his childhood here until the family moved to London sometime in the late 1860's. He married Caroline TURNER on 25 September 1870 in St Giles, Cripplegate, in London. Caroline TUNER was born about 1850 in London to Henry TURNER, who was a greengrocer. Nothing else is known about her prior to her marriage, except that on the wedding certificate, an Amelia TURNER is listed as a witness. William Claude Vincent HOWES. Born on 12 July 1871 in Hoxton Old Town, Shoreditch, London, baptised on 20 August 1871 at St Alphage, London Wall, London and died around 12 July 1872 in St George, London. Amelia Mary Catherine HOWES was born on 12 December 1872 in London and was baptised on 23 March 1873 at St Alphage, London. William and Caroline left Gravesend in London on 10 February 1874 on the sailing ship Atrato, arriving in Lyttleton in New Zealand on 8 June 1874. Before William and Caroline left England, they had already arranged to work in Pleasant Valley, near Geraldine, and their new employer met them at Caroline Bay in Timaru when the ship arrived. Their daughter, Amelia is also listed as a passenger on the Atrato. According to the Surgeons report, Amelia died of inflamation of the lungs on 7 June 1874. Like most deaths at sea, it is likely that her body was thrown overboard, even though the ship would have been in sight of New Zealand at the time. Most of these children were baptised at St Annes Church in Pleasant Valley, near Geraldine, and three of them are buried in the cemetery at the church. Click here to see photos of that church. Sometime in the early 1900's they sold the farm and moved to Nelson. Only one of their children, Christopher came to Nelson with them. By the time William died on 19 March 1932, he had changed his name slightly to William Claude. He was buried in the Stoke Cemetery, near Nelson on 20 March 1932. Caroline died on 25 April 1925 in Nelson and is buried with William. There was also an obituary notice published about Caroline, which can be found here. To learn more about William's parents, click here. For more on William's ancestors, click here. Florence Ann HOWES was born on 13 April 1875 in Pleasant Valley, near Geraldine and was baptised on 16 May 1875 at St Annes Church in Pleasant Valley. She died on 10 January 1919 as a result of the flu epedemic at the time and is buried in the Fairlie Cemetery at Fairlie. Florence did not marry or have any children. John William HOWES was born on 10 September 1876 in Pleasant Valley, near Geraldine and was baptised on 21 January 1877 at St Annes Church in Pleasant Valley. He picked up an infection after swimming in a flooded river and died as a result in July 1883 and was buried in the Cemetery at St Annes Church in Pleasant Valley on 11 July 1883. John's unnamed five day old brother also died as a result of this infection. Victor Robert HOWES was born on 23 May 1878 in Pleasant Valley, near Geraldine and was baptised on 22 June 1880 at St Annes Church in Pleasant Valley. He died on 10 February 1962 and is buried in the cemetery at Burke's Pass. 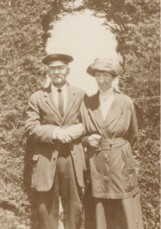 Victor married Dolina "Dolly" SMART on 19 December 1907 in Albury. James William Elijah "Jim" HOWES was born on 12 October 1908 and died on 5 January 1990 at the hospital in Timaru and is buried in the cemetery at Burke's Pass. He did not marry or have any children. Mabel Marion HOWES was born on 27 June 1910 and died on 26 September 1982 in Timaru and he ashes were later scattered in Samoa. A headstone is at the Burke's Pass. She did not marry or have any children. Dolina "Lena" HOWES was born on 24 May 1912 in Burke's Pass and died near Albury on 18 May 1990 and is buried in the cemetery at Burke's Pass. She did not marry or have any children. Esther Mary HOWES was born on 13 April 1914 in Fairlie, and died 29 October 2008 in Levin. She married Raymond MARRIOTT, and they had five children. Ellen Marjorie HOWES was born on 20 January 1916 in Fairlie and died on 18 October 1988 in Rotorua. She married Bert Royal Albert DEANS about 1941. They had five children. Phyliss Hope HOWES was born on 4 March 1919 in Fairlie. She married Morris FORD about 1947 and they had three children. Florence HOWES was born on 10 March 1920 in Pleasant Point and died on 10 September 1987 in New Plymouth. She married Douglas Brodie McDONALD about 1948 and they had five children. Victor Charles HOWES was born on 28 July 1922 in Timaru. During World War II, he went missing during air operations over Europe and is assumed dead. Approximate date of death has been given as 28 April 1943 and a memorial plaque can be seen at Runnymeade Memorial Cemetery in Surrey, England. Thomas Sydney HOWES was born on11 September 1924 in the Mount Cook Registration District (probably Fairlie). During a family Picnic on 23 January 1965 at Lake Tekapo, a boating accident happened and it is assumed that he drowned, along with several others, but no bodies were ever recovered. A headstone is at the cemetery in Burke's Pass. Edith Dulcie HOWES was born 4 June 1927 in Timaru, and died 7 December 2012 in Geraldine. She married David KINSMAN in September 1951, and they had five children. Ruth Heather HOWES was born on 3 October 1928 in Timaru. She died on 12 December 1999 in Timaru and was cremated three days later. Ruth married Grant DARE about 1953 and they had five children. Caroline Edith HOWES was born on 6 March 1880 in Pleasant Valley, near Geraldine and was baptised at St Annes Church in Pleasant Valley on 4 April 1880. She died on 15 May 1956 in Mt Maunganui and was buried on 17 May 1956 in Taumaranui. She married John Benjamin BREARS on 24 October 1905 in her parents house at Te Moana, near Geraldine. John was born about 1876 and died about 1922 in Taumaranui. Edith Caroline BREARS was born 23 July 1906 in Taihape and died around 1992. She married Arthur FINER in 1942. There are no known children. Benja Flora BREARS was born on 25 January 1911 in Taihape, and died around 2000. She married Robert EVANS around 1935, and they had three children. Amelia Mary Molly BREARS was born 10 May 1913 in Taihape, and died around 1985. She is married James WALL around 1940, and they had three children. John Benjamin BREARS was born on 19 November 1916, and died abound 1982. He married Sophy SMITH around 1945 and they had five children. William Sydney BREARS was born on 5 May 1918, and died around 1996. He married Ethel Maree RALPH about 1947 and they had four children. Elizabeth Betty BREARS was born on 27 January 1921, and died around 2008. She married Jim MARSHALL around 1946 and they had three children. Mabel HOWES was born on 26 September 1881 in Pleasant Valley, near Geraldine and was baptised on 2 July 1882 at St Annes Church in Pleasant Valley. She died on 29 July 1956 in Timaru, New Zealand and was buried in the Fairlie Cemetery on 31 July 1956. During the 1920's, Mabel and Chris lived on Mabel's brothers farm at Sherwood Downs. Details of this experience was published in the book Sherwood Downs and Beyond. Click here to see an extract of that book. She married John ROWAN at the family residence at Te Moana, near Geraldine on 18 May 1905. John was born about 1874 in Scotland. James Richard ROWAN was born 15 August 1908 in Taihape, and died 25 Dec 1996 in Wanganui. He married Edith GRANVILLE, and they had three children. Jessamina "Jessie" ROWAN was born 15 August 1908 in Taihape, and died in what is now Zimbabwe. Robert Victor ROWAN was born about 1912 in Taihape, and while he died in England, Robert is buried in Fairlie, New Zealand. 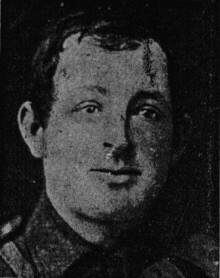 Christopher Grayson Forbes ROWAN was born about 1914 in Taihape and died about 1935 at the Hermitage at Mt Cook and is buried in the cemetery at Fairlie. This child, known as Peter, was never officialy named, was born on 2 July 1883 in Pleasant Valley, near Geraldine. He died on 7 July 1883 as a result of an infection that his older brother, John picked up (John also died of this infection) and was buried in the St Annes Church Cemetery in Pleasant Valley 11 Jult 1883. Christopher HOWES was born on 8 July 1884 in Pleasant Valley, near Geraldine and was baptised at St Annes Church in Pleasant Valley on 7 September 1884. He died on 4 December 1977 in Nelson and was cremated in Nelson on 6 December 1977. In 1912 his brother James acquired a farm at Sherwood Downs, and with Chris, they worked the farm for a number of years. Details of this experience was published in the book Sherwood Downs and Beyond. Click here to see an extract of that book. He married Sarah Louise HINGSTON on 11 April 1927 in Devonport, Auckland. Sarah was born on 29 July 1901 and died on 27 July 1989. Joyce HOWES was born around 1927, and died around 1962. She married Peter BENNETT about 1950, and they had two children. Peter Sydney Louis HOWES was born on 2 December 1928 and died on 29 July 1970. He married to Mary STALKER around 1952, and they had two children. Sarah "Sadie" HOWES was born on 14 October 1886 in Pleasant Valley, near Geraldine and was baptised at St Annes Church in Pleasant Valley on 31 May 1887. She died on 5 August 1938 in Fairlie and was buried in the Fairlie cemetery on 7 August 1938. It is known that Sarah never married or have any children. Mary Ann "Molly" HOWES was born on 23 February 1888 in Pleasant Valley, near Geraldine and was baptised at St Annes Church in Pleasant Valley on 10 June 1888. She died on 25 June 1980 in Palmerston North and was buried in the Kelvin Grove Cemetery in Palmerston North on27 June 1980. In 1911 in Palmerston North, she married James Patrick HEHIR. Caroline Onie HEHIR was born 31 March 1912, and died 28 April 2006. She was married with four children. Stanley HOWES was born about October 1889 in Pleasant Valley, near Geraldine. He died on 2 December 1889 in Pleasant Valley and was buried in the St Annes Church in Pleasant Valley on 6 December 1889. Arthur James "Jimmy" HOWES was born on 1 March 1891 in Pleasant Valley, near Geraldine and was baptised at St Annes Church in Pleasant Valley on 5 April 1891. He died on28 July 1968 in the hospital at Napier and was buried at Rongotea on 31 July 1968. In 1912 James acquired a farm at Sherwood Downs, and with Chris, they worked the farm for a number of years. Details of this experience was published in the book Sherwood Downs and Beyond. Click here to see an extract of that book. It is known that Arthur never married or have any children.